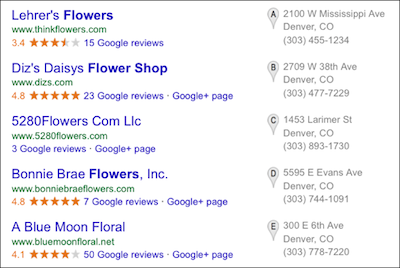 What is local search and why is it important? If you are a business that depends on local customers, such as a flower shop, an auto body shop or a restaurant, what could be better than coming up right at the top of the search engine results page for a keyword search including your geographic location? If part of your website's intent is to be relevant to local searchers, then optimizing your site for local search is a must! Because local search results are now being placed very highly in the search engine results pages, the competition is steep and it's important to make sure your site is well optimized for local search. Marty owns a flower shop in Denver, Colorado that specializes in weddings. In general, all of Julia's customers are going to come from in and around Denver. The shop is not going to be providing services to people in Miami, Florida! So it is important for Marty's website to reach searchers in and around Denver looking for the services she provides. How are local search results displayed? A local search is a query that involves a keyword along with a geographic location. You probably do local searches all the time when looking for a business in your area. Looking back at Marty's flower shop in Denver, Colorado a local search would be just that, "denver colorado flower shop", or something similar. You will see displayed in the graphic, next to the map, flower shops right in Denver. It's easy to add these tags to your LinkskyVISUAL site. Click on Page > Page Properties > Metadata to access the fields to enter your tags. Here is a link to a tutorial with more detailed information on this topic: Adding title, description and keywords tags. 3. Make sure you have contact information, including your physical address and phone number, in text on every page of your site. Remember, search engines read text, not graphics. An easy way to do this is to add a footer to each page of your site. You can do this by dragging a Text Widget to the bottom of your page and entering your contact details there. 4. Add your location to your image alt text. If you have an image of your flower shop on your site, you could give it the image alt text "Marty's Flower Shop, Denvor, Colorado". Here is a link to more information on this: Adding alternative text to images. 5. Submit your site to Google's Local Business Center. Here is a link with more information: Google Local Business Center. 6. Submit your site to Yahoo Local Listings. Here is a link with more information: Yahoo Local Listings. 7. Submit your site to local directories. Examples include Yellowpages.com, SuperPages.com, InfoSpace.com, InsiderPages.com, Local.com. 8. Send an email to local establishments. For example, your Chamber of Commerce or another local business that compliments yours (a complementary local business for a flower shop might be a catering business), and request a link to your website from theirs, or to do a link exchange. 9. Look for blogs and forums that focus on your topic. Making comments on blogs written by people in your area (good comments, not spam comments) is an excellent way to improve visibility. You can most of the time post a link back to your site. These techniques for promoting your site locally are also good for your overall SEO! Please keep in mind that competition for local search is high, so just because you perform these techniques doesn't mean your site will automatically receive high placement for localized searches, but it will surely help!